such contests observed, when the musth male was smaller in body size, the smaller male emerged victorious in 86% of interactions. Joyce Poole also observed that, when a large, high-ranking musth bull chased a smaller, lower-ranking musth bull, the latter often stopped showing signs of musth (urine dribbling, temporal gland secretion, and behavioral postures). On the other hand, two high-ranking musth bulls did not cease musth, but tried to avoid each other's company by using different areas if their musth periods overlapped. The musth periods of many large males, of course, were also spaced out during the year to avoid overlap. The aggressive contests described above are confined to threat displays, chasing, and minor combat using tusks. Escalation of contests into serious fights is rare, even when bulls are in musth. Observations on retreat distances by males of different sizes seem to suggest strongly that male elephants not only believe that musth in an opponent announces aggression, but also enables them to assess the chances that a contest may escalate into a serious one. In 14 years of field observations, Joyce Poole observed only 31 escalated fights between bulls, of which 20 were between pairs of musth bulls; two such contests resulted in the deaths of one contestant. 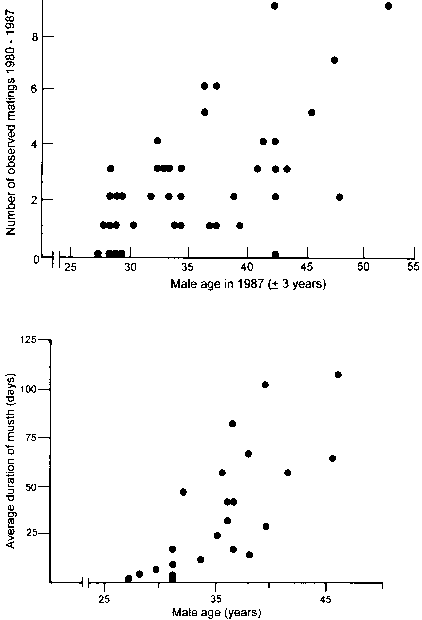 During 1981-1982, I recorded three such elephant deaths in male-male combat in southern India. Since then, I have heard of few such instances, but this could be a reflection of the overall paucity of large males in southern India as a consequence of ivory poaching. Anthony Hall-Martin recorded seven adult bulls killed in fights during 19761986 in South Africa's Kruger National Park. Interestingly, all seven victors were bulls in musth, while four of the bulls killed were themselves in musth.